About Us | Rhino Exteriors Inc.
Rhino Exteriors was created to give clients the chance to One-Stop-Shop for the entire exterior of their home. No need to coordinate several trades. In its growth, Rhino Siding Inc and Fortified Exteriors Inc merged under this new name. 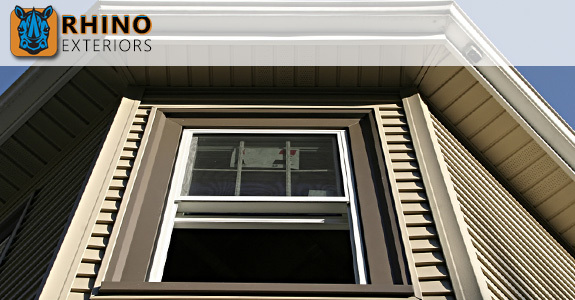 This merger was designed to take the meticulous detail and office management of Fortified and work it into the High Quality and long term business plans of Rhino Siding Inc.
Braydon & Jason Byam, owners of Rhino Siding Inc and Rhino Exteriors have been in the business for the last 8 years and have positioned themselves in this industry for another 25 years. As brothers separated by 13 years, they never shared much in common, but as time, wives and kids entered their lives, they grew closer and tighter than even the best families and tightest friends. They are driven to succeed and have a passion for this business. They have thrown down and grown up with roots planted firmly in Okotoks and have extended family all over southern Alberta. Braydon and Jason are driven by hard work and dedication to client satisfaction. With a team in place of equally committed staff, they are joined by the former Fortified Exteriors Inc Team of Andy Lawlor and Kim Evans. together they are dedicated to improving the industry standards. Their goal is to maintain the ever changing building code without sacrificing the look of your home. We specialize in James Hardie, Canexel, vinyl and wood siding, Smartboard and aluminum battens, all decorative details, aluminum and wood soffit and fascia, as well as 5″ aluminum gutters, Asphalt & Steel Roofing, Stucco, and Stone services. Painting is quoted on all of our projects but at this time we do not offer painting as a separated service. When you hire Rhino Exteriors, you will see and meet either Jason or Braydon. We pride ourselves on minimal service calls because we ensure the job is done right the first time. This means we do every job with the same dedication and attention to detail. We look forward to providing you with the hassle free service you deserve.